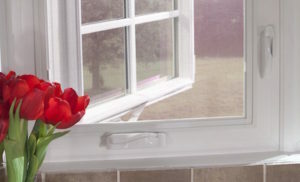 Replacement casement windows are easily opened with a crank outwards to the left or the right. This style of window provides open views and full ventilation. Casements also deliver superior energy efficiency and weather resistance. If you want views and lot’s of light, a replacement casement window is the right choice for you. With top-to-bottom ventilation when cranked open, they are beautiful, as well as energy efficient replacement windows. What are the key benefits of replacement casement windows? Casement windows are ideal for hard to reach places. For example, behind a kitchen sink. Other benefits include the incredibly easy to open crank system, ideal for older adults who could struggle with lifting or sliding a window. Replacement casement windows are also incredibly energy efficient. Casement windows are best suited for modern home styles such as mid-century modern, prairie, tudor, ranch or art deco. Depending on the style of your home, casement window installation can be customized with hardware and grid options. Replacement casement windows are affordable and will up-date your home while adding curb appeal.